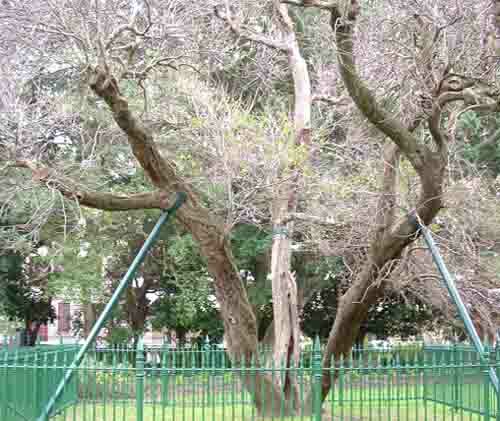 At the time of arrival of van Riebeeck in the Cape way back in 1652 Cape Town had no fruit trees other than the wild ones that grew here. As his orders were to plant a garden to supply fresh produce he made it his business to plant fruit trees as well. Many experiments were done in the Company gardens as the Dutch had no idea as to what plants and trees would grow here. At the time scurvy was a major problem for seafarers arriving at the Cape and as vitamin C was a cure for this he thought it might be an idea to get and plant some citrus trees at the Cape. Citrus fruit trees first became known when they left there original home in the tropical rain forests of China. The first orange was known as the sour orange, and together with the lime and the lemon were introduced to the Middle east by Arab traders. The trees and fruit were popular and soon orange trees were found all over the Middle east and along the northern coast of Africa and even in Southern Europe in places such as Spain. The sweet orange was only discovered in the 15th century when Vasco da Gama was given a load of them when he visited Mombasa on the east coast of Africa. It is thought that he took some of the fruit back to Portugal with him as the Portuguese claim that they were the first people in Europe to cultivate the sweet orange. When van Riebeeck asked for orange trees they were shipped to South Africa on a yacht called the Tulp in 1654 from the island of St Helena which was discovered in 1502 by Juan de Nova Castella who came across it on the way from India with the Portuguese fleet . The oranges on St Helena must have originated from Portugal as their ships called there and sick sailors were given oranges to eat to cure their scurvy. Other varieties of orange trees were imported to the Cape from India. In total 1162 orange trees were eventually planted in the Company gardens and eventually in 1661 the first sweet oranges were picked at the Cape. 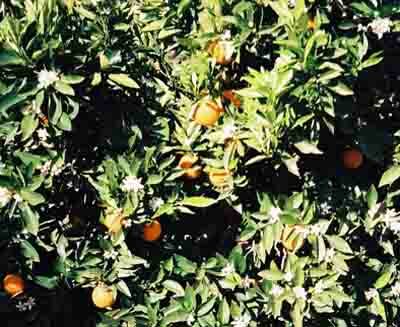 As the population at the Cape spread out new farmers also planted orange trees that originated from the original stock imported by van Riebeeck. Eventually in the late 18th century orange trees arrived in the Olifants River valley where they flourished in the warm climate of the region. The citrus industry in the Cape had begun. Today on a farm called Hexriver in the Olifants River valley an original seedling tree is still producing oranges 200 years after being planted there. It has been declared a national monument by the SA Monuments committee. Over the years many different varieties of orange have been introduced into South Africa and the industry has grown to such an extent that the export of South African oranges has become a major earner of foreign exchange for the country. The South African citrus industry however has a problem that it has yet to solve. It produces oranges that ripen in the early season and late in the season but nothing in mid season which leaves workers on farms with about three weeks to twiddle their thumbs while the late season oranges ripen. The farmers are experimenting with an orange called Clanor which is called a seedless seedling. The only reason it is not yet making an impact on the world markets is that it is not produced in sufficient quantities yet. Next time you visit your local supermarket buy South African oranges that originate from the Olifants River valley.